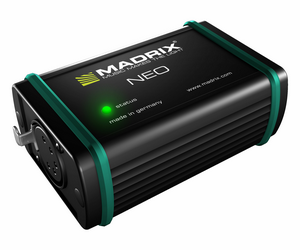 MADRIX NEO is a USB 2.0 DMX512 interface. It can be used for input [DMX-IN] or output [DMX-OUT]. ▪ Make sure to read the provided MADRIX NEO Quick Start Guide first! ▪ Click Apply to confirm. ▪ Click OK to close the window. The NEO allows you to send or receive data via MADRIX using 512 DMX channels. ▪ The MADRIX NEO features a 5-pin, female XLR connector. ▪ If you want to use DMX-IN, please use a 5-pin XLR male to 5-pin XLR male gender changer. To ensure interruption-free operation of the software and devices, please make sure to check the power-saving settings of Windows. When using a MADRIX KEY in addition to a MADRIX hardware interface, please make sure to install the required software components during the installation process [MADRIX KEY Driver]. 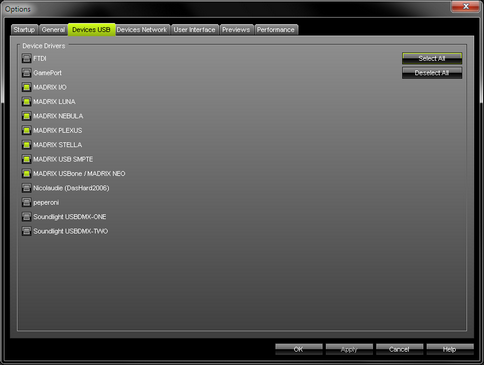 ▪ MADRIX NEO already includes the MADRIX software license for 512 DMX channels. The data output [the license] is automatically activated when you connect the PLEXUS to a computer that has the MADRIX software installed and running and the USB drivers enabled in the software. ▪ The MADRIX KEY is not necessary for the MADRIX PLEXUS. ▪ The MADRIX KEY is not necessary for the MADRIX NEO. ▪ Up to 60 NEOs can be connected to a USB host controller without having any frame rate problems. Please connect every NEO to an active USB 2.0 port or use a USB 2.0 hub with a power supply.